This EA trades using the Stochastic Indicator. It offers many trading scenarios and flexible position management settings, plus many useful features like customizable trading sessions, a martingale and inverse martingale mode. Stochastic Settings - Enter your desired stochastic input parameters. Trading Settings - Select the oversold/overbought values, trading direction and trading scenarios to trade. Session Settings - Enable or disable trading for the Asian, European or American sessions. 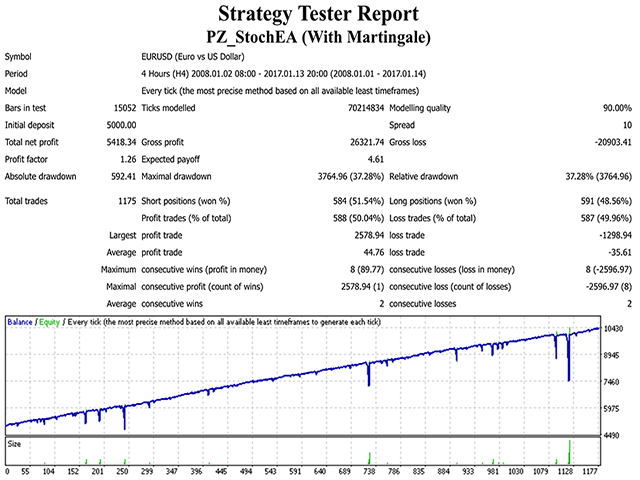 Position Management - This group of settings applies to trading decisions and trade management. You can select trading direction, break-even in pips, trailing-stop in pips, trailing-step in pips, stop-loss in pip and take-profit in pips.